Alison’s work was selected for several Royal Ulster academy exhibitions whilst working as a freelance illustrator. 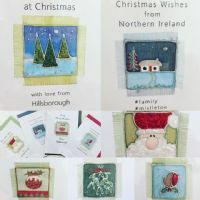 Alio Designs was established in 2004 when she began producing framed pieces and greetings cards featuring her own hand painted pure silk squares. She draws her inspiration from simple beauty and lifestyle trends to create unique affordable pieces of art.